A 14,000 sq.ft. modern state-of-the-art winery, with two barrel ageing cellars where hygiene is the utmost importance. Wine is processed using mostly gravity flow methods and gentle pump-over steps. Beautifully laid out tasting room with many old-world wine making tools from Hungary on display. Very relaxed and friendly atmosphere. Tours & tastings by appointment only for 4-8 people. Wine Education: Owners are also wine importers from Bordeaux and Hungary and provide educational comparisons between Old-World and New-World wines and wine making techniques. 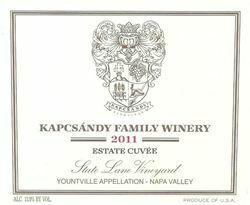 To join the wine club, visit www.kapcsandywines.com or call 707-948-3100.